Hop Industries Releases Quality Assurance Tips for Offset Printing on Plastic | Industry Analysts, Inc.
December 4, 2018 — Lyndhurst, NJ — Hop Industries, manufacturer of the durable Hop-Syn synthetic paper today announces the availability of a new tips guide for offset printing on plastic substrates. 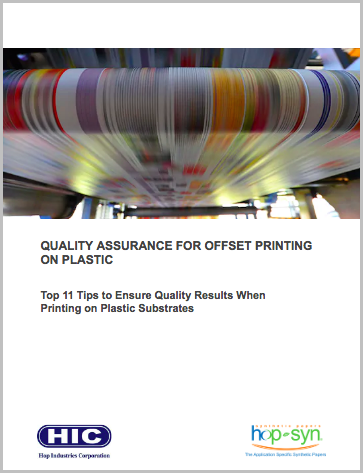 “Quality Assurance Tips for Offset Printing” is a handy reference guide for press operators to ensure consistent results throughout the printing process. Request a free copy of the guide by calling Hop Industries at 800-524-0757 or fill out the online form. “Printing on durable substrates requires attention to certain aspects, such as humidity, ink adhesion and friction, to ensure consistent results. Our newest tips guide gives operators the information they need to keep systems in check,” comments Jack Smith, Senior Vice President, Hop Industries. Printing on plastics like Hop-Syn synthetic paper has numerous advantages, especially for applications that require durability with high impact. The latest guide helps press operators avoid common printing challenges relating to ink drying, color sequence, poor ink/water balance, and more.